Introduction. External Morphology, Internal Anatomy. Taxonomy and Identification. Gut, Food and Feeding. Physiology. Chemical Composition. Reproduction. Growth. Population Biology. Behaviour. Distributional Ecology. Distribution: Oceanic Species. Distribution: Shelf and Coastal Species. Copepods in Ecosystems. References. Taxonomic Index. Subject Index. 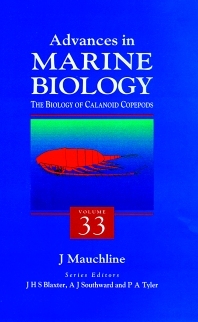 This special volume of Advances in Marine Biology covers in detail the biology of calanoid copepods. Copepods are probably the most numerous multicellular organisms on earth. They are aquatic animals that live in both marine and fresh water, and are of prime importance in marine ecosystems as they form a direct link between phytoplankton and fish. This volume is essential for all marine biologists. Advances in Marine Biology contains up-to-date reviews of all areas of marine science, including fisheries science and macro/micro fauna. Each volume contains peer-reviewed papers detailing the ecology of marine regions. Researchers and students of marine biology, fisheries science, and ecology.